← Not Just Pupus, Poi and Pineapple – Hawaii Has Salts too! When I was growing up, we had one of those little round black barbeques on three legs, with a grill that could be raised or lowered with a crank. Everyone in the neighbourhood had pretty much the same thing. Of course, these were the good’ole days of bags of charcoal lumps, which my Dad would pour into the barbeque, douse heavily with evil-smelling lighter fluid and make us kids stand back as he tossed a match into it from several feet away. (Good thing my mother had a supply of eyebrow pencils) Later came the charcoal “briquets”, which looked neater, but basically did the same thing. Both were messy, smelly and generated a somewhat unusual aroma around the neighbourhood. It didn’t matter if Dad was grilling hamburgers, chicken or steak. The smell was pretty much eau-de-lighter fluid and charcoal. Barbeques weren’t a frequent event in our family, but my Dad did barbeque on summer weekends. We would romp around the yard before dinner (children can’t sit still) and smell the odours coming from other neighbours barbeques. Once in a while, my Dad would make the comment that “…so and so two doors down must have gotten a raise”, as he could smell steak wafting from their yard (we were cooking hamburgers). “Big Boy Barbecue Book” back cover. This Chef must have gotten a raise. He’s graduated to a really fancy barbeque! Dad, of course, had to wear the heavy-duty red-checkered gloves to tend the fire, and naturally, for his birthday one year, my sister and I saved enough of our allowance to get him one of the silly white hats with “Bar-B-Q Chef” embroidered on it. He wore it in good humour, including the goofy apron with grilling related euphemisms on it. At the time, Dad was the master of the barbeque, and it was the men who did the barbequing. The “Moms” stayed in the kitchen, making potato salad and assembling the peripheral ingredients, such as pickles, mustard, relish, etc. and the dessert (usually a Jell-O concoction of some sort). 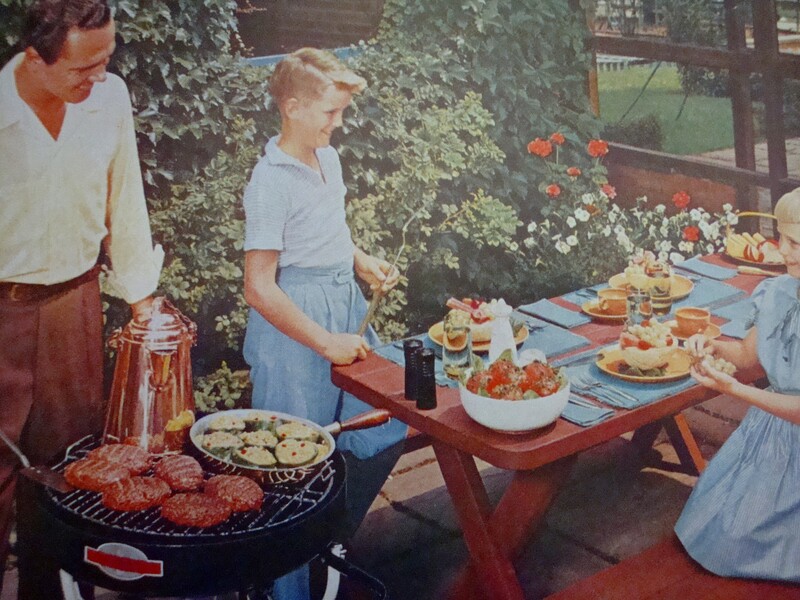 When I would occasionally peer over the fences in our neighbourhood, I never once saw a female tending a barbeque. It simply wasn’t done. Barbequing was a male dominated domain. 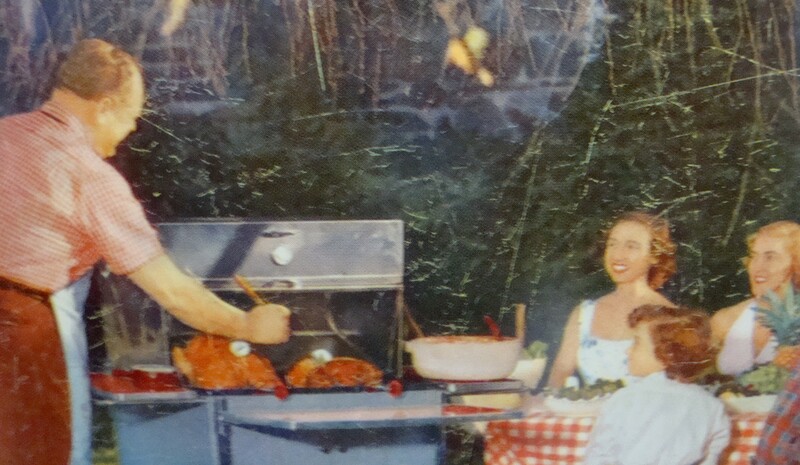 Men bonded with their barbeques. Thank heavens for women’s lib, because when it came, I could finally become master of my own barbeque! 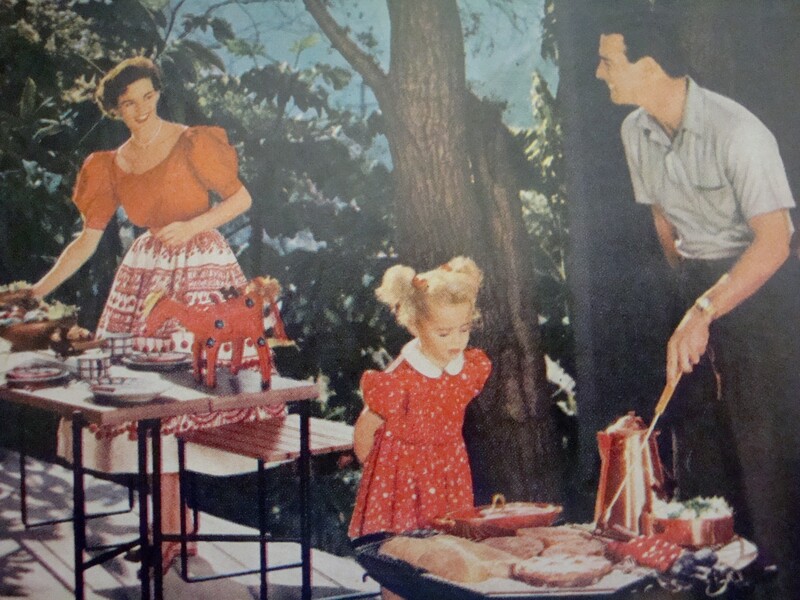 Back in the days, barbeques were part of the North American culture. It was a big event, with friends and neighbours and lots of noise. The guests arrived hauling their own lawn chairs, and sometimes beer, and the Moms, of course, always brought a dish to help out the hostess. The Moms would be dressed like June Cleaver, in pretty dresses and open toed shoes (probably wearing pearl necklaces too), and Dads would be in casual pants, short sleeved shirts and loafers. No jeans (I don’t think they had been invented yet), no shorts, no sandals, no sneakers and no baseball caps. Just clean, wholesome, attractive dress to reflect their good taste. Those were sensible times. 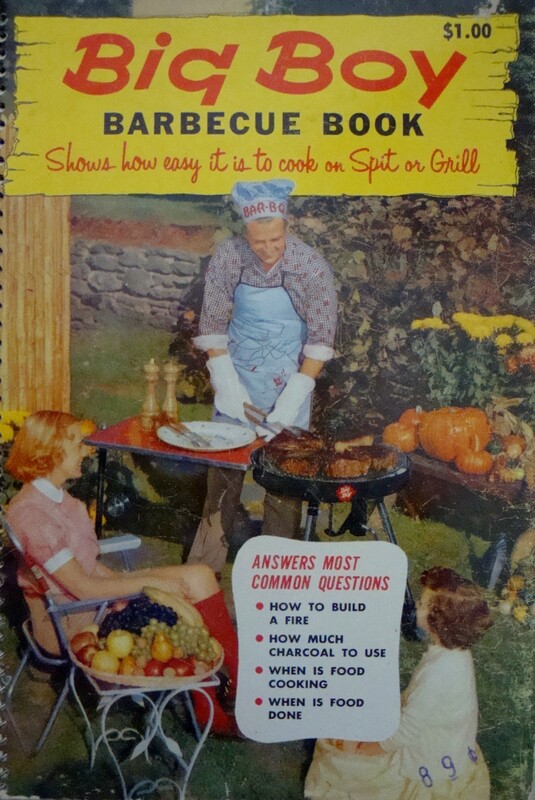 In my cookbook collection, I have a number of barbeque and grilling books, but one of my favourites brings me back to my childhood: “Big Boy Barbecue Book”, from The Home Economics Staff of Tested Recipe Institute, Inc., “With the Cooperation of Barbecue Experts of Big Boy MFG. Co.” The photos in the book are reminiscent of saner times. 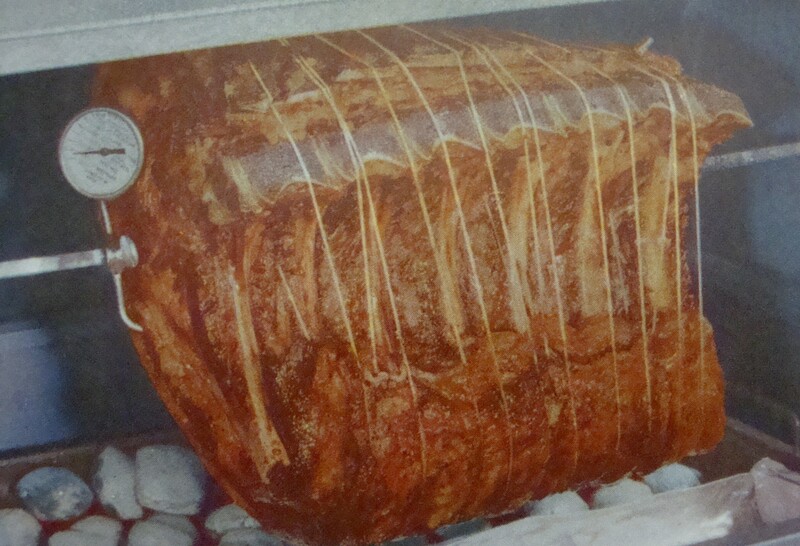 In addition to the staples (hot dogs, hamburgers and chicken), there are more “exotic” recipes for a whole leg of lamb, standing prime rib roast, sirloin steak and rock lobster tails. 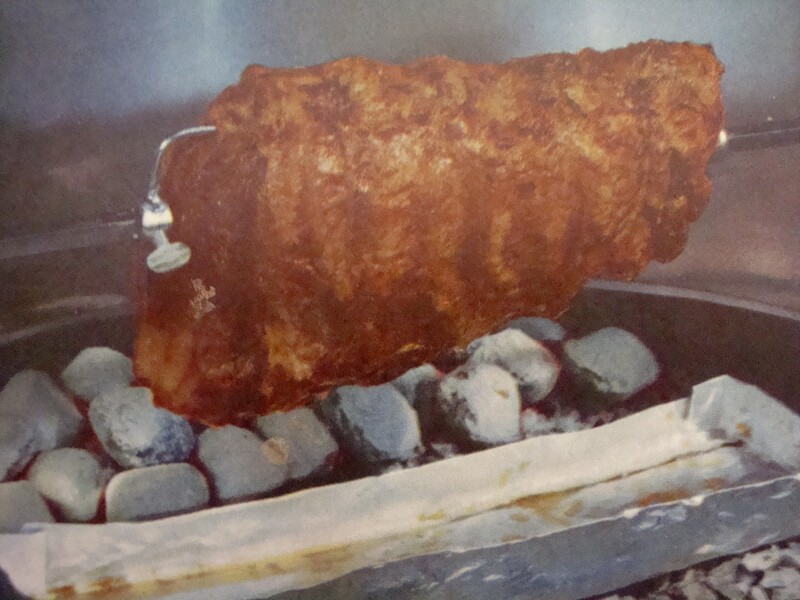 Seeing these photos, I was compelled to research food prices in 1957, the year “Big Boy Barbecue Book” was published, to see how the heck the barbeque master could have afforded to serve 12 rock lobster tails to the neighbours, not to mention a standing prime rib roast with a dozen ribs! Big Boy Barbeque recipe calls for three 2 inch thick sirloin steaks. 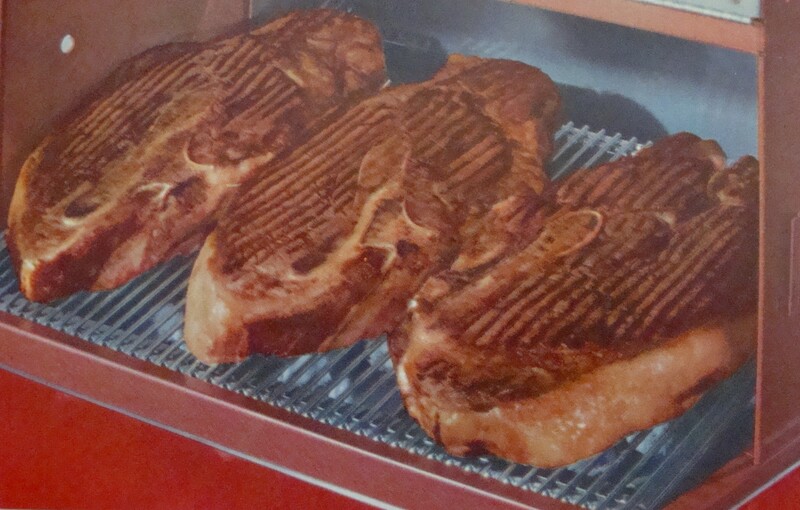 At about 1.5 pounds apiece, at $.59 per lb, $2.66 in 1957 & about $32 + in 2013! Forget this hunk of prime beef tenderloin in 2013, unless you got a raise! Of course, if you wanted to wash this meal down with some beer, a six-pack of most beers would cost you about $1.25 in 1957. In 2013, the lower end beers can be purchased for $5.00 (sometimes even lower on sale), but go up from there. 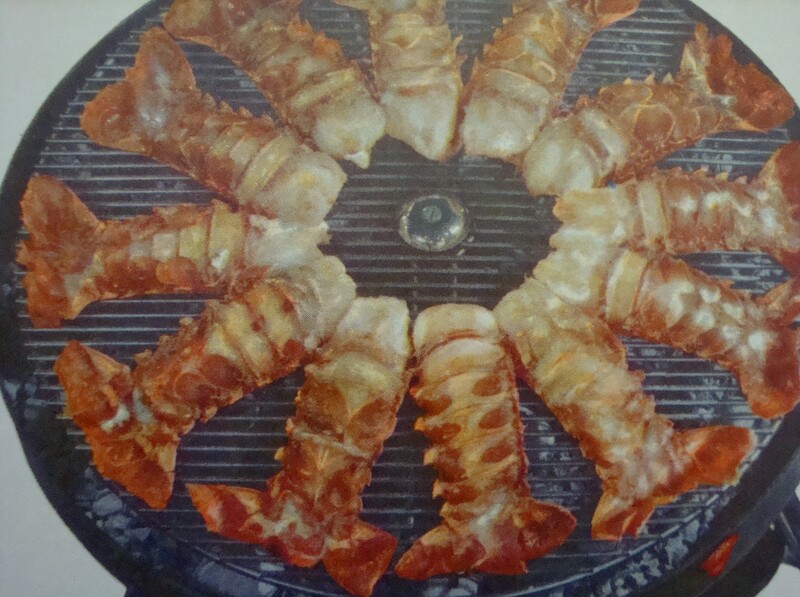 The South African rock lobster tails in the 1950’s were usually around 8 ounces each: today you can find them online and the average weight is about 4 to 5 ounces each. Rock lobster tails are harvested from other locations, and are slightly less expensive, but in the 1950’s, South Africa was the major supplier. 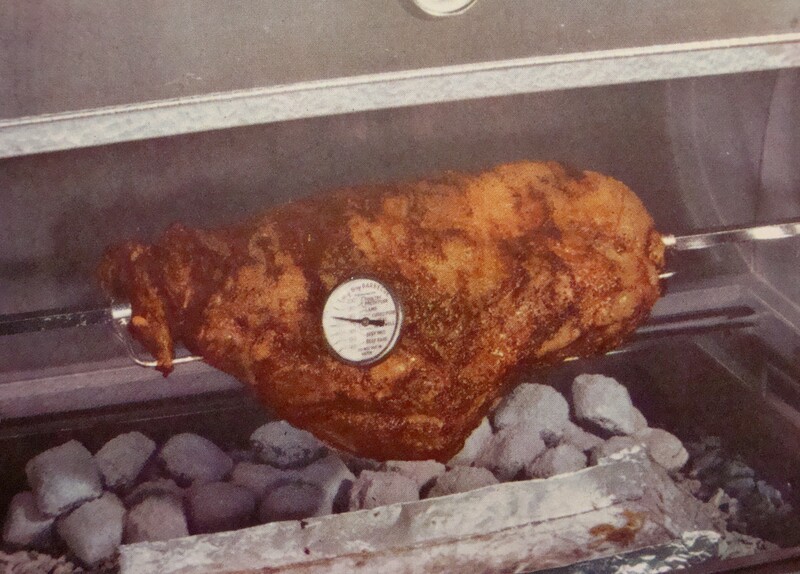 7 pound leg of lamb – $4.69 in 1957, about $104.00 now. Baaah! Now, we all know about inflation, the consumer price index, regional variations, etc., and for sure, the average income in 1957 was a lot lower than it is today, but even so, I can recall my Dad barbequing sirloin steak on occasion and once or twice, even some rock lobster tails (which he received as a Christmas gift from one of his clients). It wasn’t all about hot dogs, hamburgers and chicken. Still, all things considered, if I invite you to my house for a barbie, it’ll be hamburgers and chicken. If you want rock lobster tails, you’d better bring your own! I’ll supply the propane (bye bye charcoal, black hands and stinging eyes). No wonder “pot luck” was invented. It saved the host and hostess from bankruptcy! 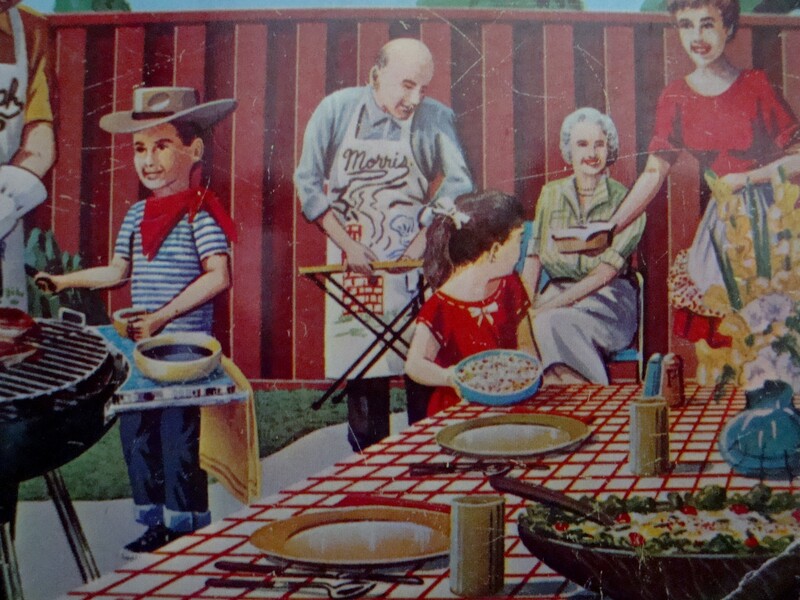 Ah, the good old barbeque days of my childhood. Messy, smelly, time-consuming and carcinogenic (we didn’t know that at the time, of course), but cheap! This entry was posted in Cookbooks, Cooking, Cooking and Social History, Cooking Technology, Eating, Food Trends, Uncategorized, Vintage Cookbooks and tagged 1950's, Backyard Barbecues, Barbecue, Barbeque, Big Boy Barbecue Book, cookbooks, Cooking, Food Prices, Grilling, social history, Sue Jimenez, time capsules. Bookmark the permalink.